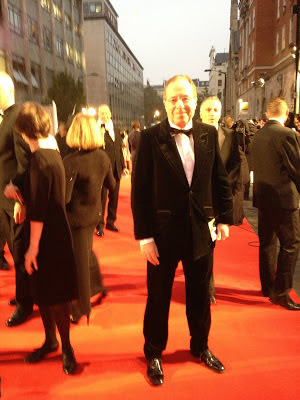 Was invited to the fabulously glitzy Royal Premiere of Skyfall last night, attended by about 5,000 folk in their finest finery (including yours truly! ), and in the presence of Prince Charles and the Duchess of Cornwall. They both came to the Royal Premiere of my last movie, The Merchant Of Venice in 2004. Camilla is quite delightful – in the line up when I was presented to her, I asked her if she was still smoking (knowing Charles does not approve) She grinned and said, cheekily, “Why, do you want someone to come along behind the bike sheds with you for a quick fag?” I thought what a delightful lady she was. Interestingly I had met Princess Diana many years earlier, and she had a very similar sense of humour. So what was the film like? I’ve always been a Bond fan, but for me the man has always been Sean Connery. I’ve not been enthusiastic about the previous two Daniel Craig Bond movies – although I love him as an actor – Layer Cake if you’ve never seen it, is wonderful. However I did warm to Craig more in this film, but is it the best as some critics are saying? Not by a country mile, in my view. It was fun, and it had some of that much needed humour back, but I felt, despite its broad canvas, it lacked the style, the panache, the sheer exuberant brio of many of the earlier films, like Dr No and Thunderball. So my overall verdict? It is fun, it has a great opening sequence, overall it is an enjoyable, far-fetched as ever experience to watch – but as a match for the best of the 23 Bond movies to date, it’s good, but it’s no cigar.